Large scale clear-cuts and round-log export negatively impact fisheries, wildlife, recreation and tourism with little to no gain for our local economy. LCC works to move logging practices away from clearcutting and toward small-scale selective cutting and value-added processing. We advocate for these values in the Haines State Forest, the Tongass National Forest, and forest lands held by the University of Alaska Land Trust, and the Mental Health Trust Authority. The Haines State Forest was established in landmark legislation on July 1, 1982. In the same year the State of Alaska established the Alaska Chilkat Bald Eagle Preserve. This step, taken in part due to advocacy from newly formed Lynn Canal Conservation, was taken to protect the largest gathering of bald eagles in the world. The law's central tenet was to utilize, perpetuate, conserve, and protect the renewable and nonrenewable resources through multiple-use management. The Haines State Forest comprises some 260,000 acres of State managed lands and water including portions of the major river watersheds of the Lower Klehini, Chilkat, Chilkoot, and Ferebee Rivers as well as their tributary water systems with approximately 93,500 of those acres covered by forest. 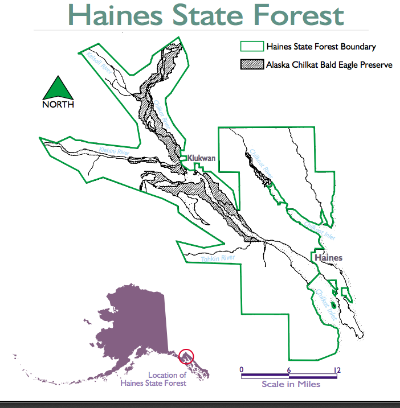 The current Haines State Forest Management Plan was adopted 16 years ago, in 2002. Every 2-years the Division of Forestry releases a 5-year Management Schedule. Download the 2018 - 2022 Schedule here. LCC has asked the Division of Forestry to draft a new Management Plan which would defer to resource uses and values other than timber. The current economy of Haines is diverse and dependent on healthily functioning ecosystems and scenic resources; taken together, tourism, fishing, and location-neutral residents account for nearly all the locally generated revenue and jobs in the Chilkat Valley. The Haines State Forest needs a Management Plan that is reflective of social and environmental changes.